If you usually hang around here for the meal ideas or easy dessert stuff, don’t get discouraged. “But, Christina,” you say, “When are we going to get a recipe that has more than 3 ingredients? This is getting ridiculous.” Well… not today. Today, you get a recipe with two ingredients. Maybe three if you count salt. Sorry. Tomorrow I will post a recipe for boiled water that will blow you away. 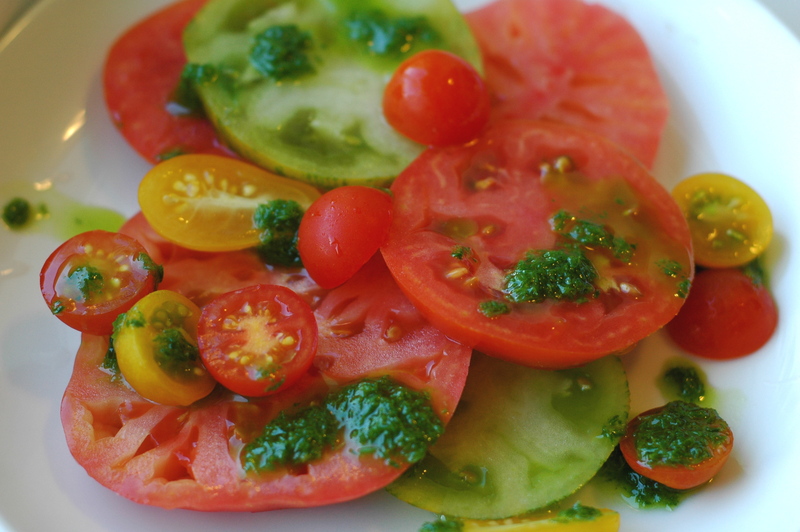 I know I literally just wrote a tomato salad post saying how it was so simple that I felt stupid posting a recipe. Well this puts that post to shame. Chive oil? Can this be worth an entire post? Really? Oh yes. Yes, yes, yes. A thousand times yes. Chive oil will change your life. Ok, , it won’t change your life. But it will change everything you planned on eating today by making it infinitely more delicious. Were you going to have eggs for breakfast? Drizzle some chive oil over them and they are all fannnnncy. Sandwich for lunch? Stir a bit of this oil into a dollop of mayo for the best sandwich spread you’ve ever had. Grilling for dinner? Making chicken for dinner? Heating up mac and cheese for dinner? I have added chive oil to all of these things and they are immediately made amazing. After all that, you’ll still have leftovers that make a great base for a salad dressing, or an incredible addition when added by the spoonful to any kind of soup, or the perfect topping for a big pile of sliced tomatoes. I realize you might think I’m going all hyperbolic about how amazing this chive oil is. But the thing is, I don’t think I am. I just think it’s really, really good. I really, really want you guys to try it. Please? It’s one of those things that is so much more than you think it will be. It’s bright and herbal, but also perfectly garlicky and bold. 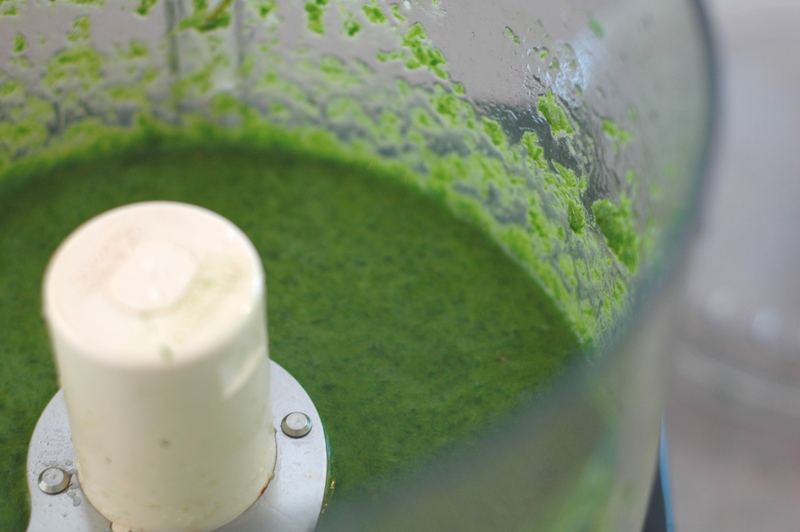 It has a gorgeous bright green that actually stays beautiful and bright, unlike, say, pesto. Incidentally, it’s also the perfect way to store chives from your summer garden, because it freezes beautifully in small containers, or in ice-cube form. Trust me, you will want a few cubes of this tasty summer deliciousness tucked away in your freezer come February. This chive oil is inspired by a dish that they used to serve at Firkin in Libertyville, IL, which they don’t have on the menu anymore. After a mourning period of at least a year, after a lot of trial and error, I realized that yes, it was just chives, olive oil, and salt. Seems too good to be true, but there it is. Wash and clean chives, removing any dry or grassy bits. 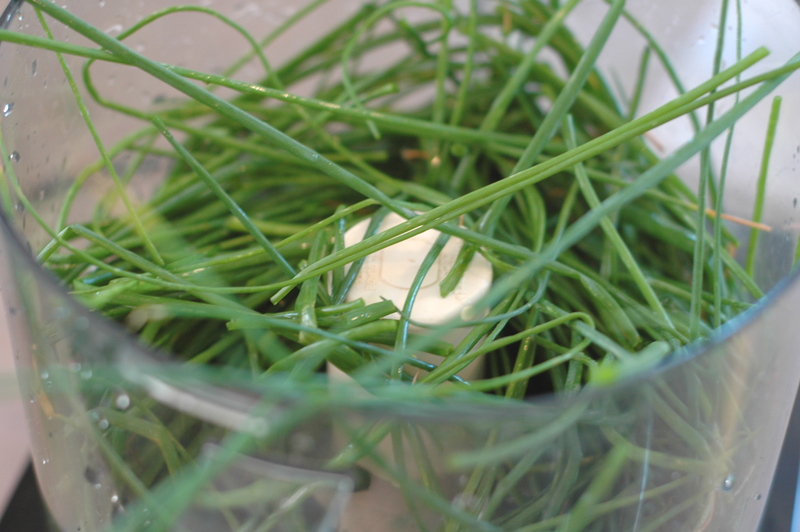 In the bowl of a food processor, pulse chives a few times until roughly chopped. Then, with the food processor running, slowly stream in olive oil. (You may use a bit more or less oil depending on the size of your bunch of chives.) Once you’ve reached your desired consistency, add salt to taste, starting with 1/2 teaspoon. Pulse a few more times. Finished chive oil can be stored in an air tight container in the fridge for a week or two. Hope you like it as much as we do… it’s definitely a game changer!